Tomato garlic sevai is an easy and perfect light meal made with vermicelli, garlic, onion, tomato, and some Italian seasoning. It takes just minutes to make and bursting with flavors. Few days ago I had to make a recipe with vermicelli. And I wanted something different. Then suddenly this idea came to my mind and the result was just amazing. Sevai / semiyan / seviyan are the Indian vermicelli often made from either whole wheat flour or maida or even suji. The sevai I have used here is of thick variety and made from whole wheat flour. To make this tomato garlic sevai besides vermicelli, tomato, onion and garlic you need some Italian seasoning. Like oregano and mixed herbs. The cooking process starts with making the tomato puree, followed by cooking the sevai and finally making a sauce and mix everything together. This tomato garlic vermicelli is a wholesome meal in itself. Serve this as a breakfast or pack in kids lunchbox and everyone will love this. Let me know your thoughts about this tomato garlic sevai recipe in the comment section. Also, you can connect with me on Instagram, Facebook, Pinterest, and Twitter. Heat sufficient water in a pan by adding tomatoes and the water to boil until you see some cracks over the tomatoes. Pour off the water and cover them again with cold water. Peel off the skin and blend until smooth. Skip this step if you are using the roasted vermicelli. Heat a tsp oil in a pan. Add vermicelli. Saute continuously over a low flame until the vermicelli turns golden. Once done transfer to a plate or bowl to stop the cooking process and set aside. Heat sufficient water in a pan by adding salt. Once water starts to boil, add roasted vermicelli. The water has to be slightly salty. Let it cook until vermicelli is done. Make sure the vermicelli should not be overcooked. Drain the vermicelli and set aside. Heat oil in a pan. Add oregano and chopped garlic saute for few seconds. Add chopped onion. Saute until onion slightly changes its color. Once done add tomato puree followed by salt, sugar, red chilli powder and black pepper powder. Stir to mix. Cover and cook until tomatoes leave oil. Add 1-2 tbsp water and stir well. Add the vermicelli. Carefully stir to mix and let it cook for a minute. Finally, add red chilli flakes and Italian mixed herb and mix well. Tomato garlic sevai is ready to serve. Serve hot. 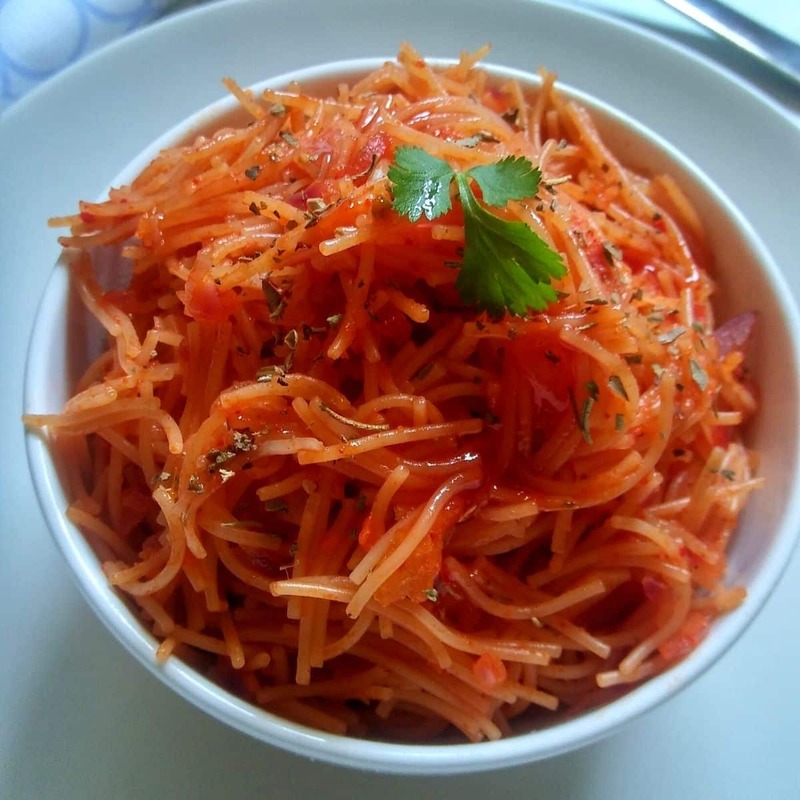 This recipe is contributed to the FB group Healthy Wealthy Cuisines for the theme Vermicelli. Below are the contributions of other members. 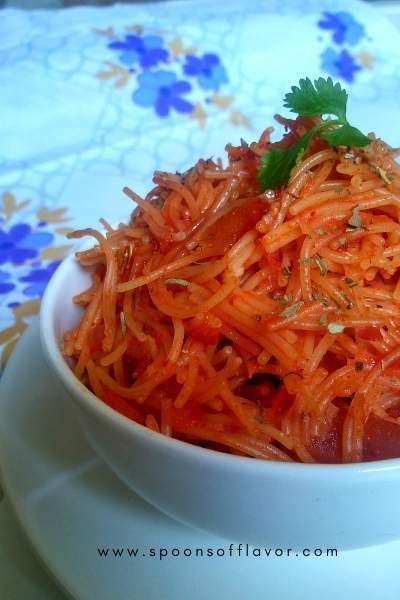 My son is fond of Italian dishes and this whole wheat vermicelli with tomato and garlic flavor sounds healthy wholesome option. Lovely share ! 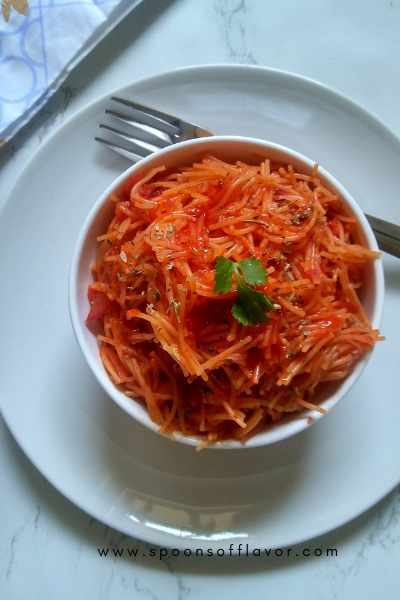 Tomato Garlic Flavoured Vermicelli sounds so tangy and flavourful … Addition of Italian seasoning gives lovely boost .. I have never tried the sev with italian seasoning. I am sure the pasta like feel yet the ease of cooking makes it yummier. Loved the recipe Geetanjali.. Vermicelli in Italian flavours! !.kids are going to love this.. beautiful color of the vermicelli.. Wow!! Interesting twist. Looks super delicious and super inviting. That color looks so beautiful. Italian version of sevai/vermicelli! I like it! I love to use Italian herbs in any dish to amp up the flavor but have never used it with vermicelli! The color too is gorgeous! Thanks for sharing this unique twist dear! Tomato flavour and the tomato colour are so inviting. Love twist to the usual sevai.